Decorating for any holiday can get a little overwhelming. Do you buy things after the season when they’re on sale, then store and hope you remember where you put them next year? Do you try and make everything leading up to the holiday? And what about last-minute parties or guests for whom you want your house to look spooky? There are a few last-minute Halloween decoration ideas that will help you pull everything together easily and stress-free. 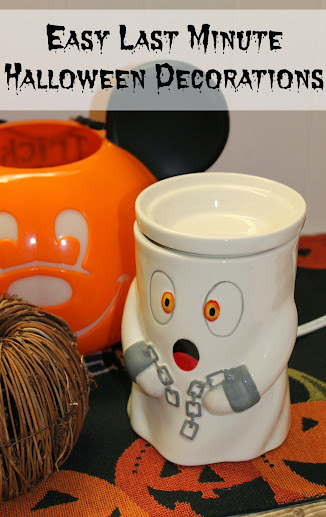 Many of them are inexpensive, too, like my DIY Halloween candy dish. 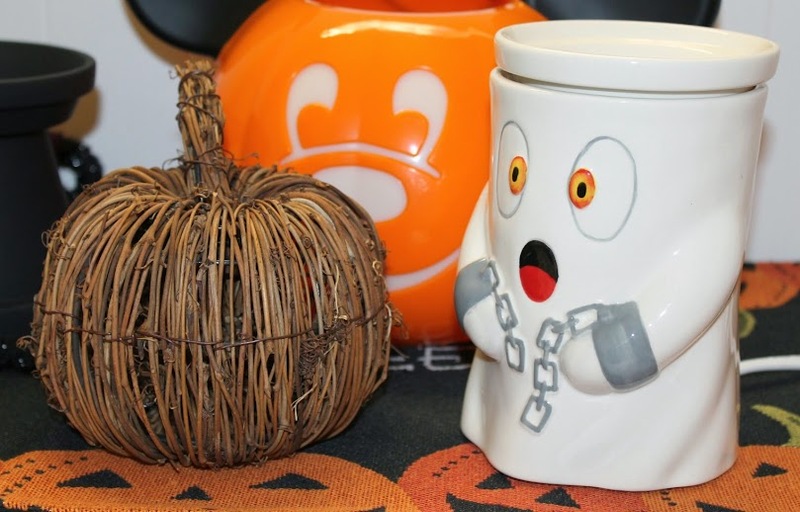 Trick or Treat buckets have come a long way from the plain pillowcase. Why enjoy them only for the short while you’ll be out collecting candy with the kiddos? 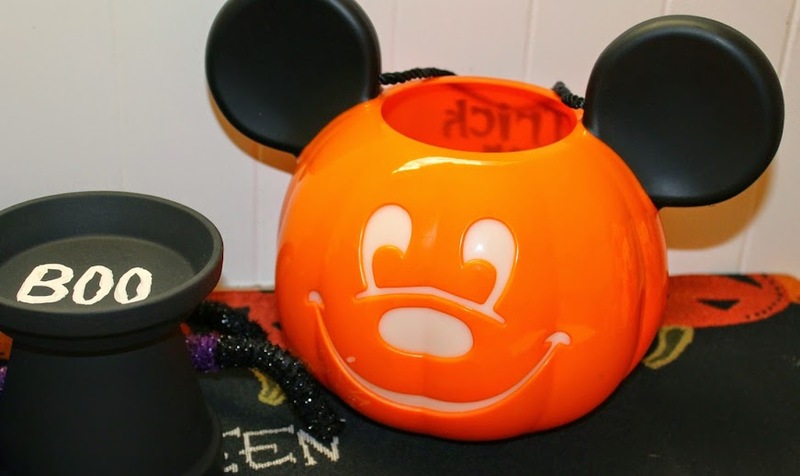 I use Bubbles’ light-up Mickey pumpkin bucket on the table as an easy accent (plus we know where it is to grab before heading out the door). If you set out the candy buckets, that might start you thinking about decorating with candy itself. Great idea! 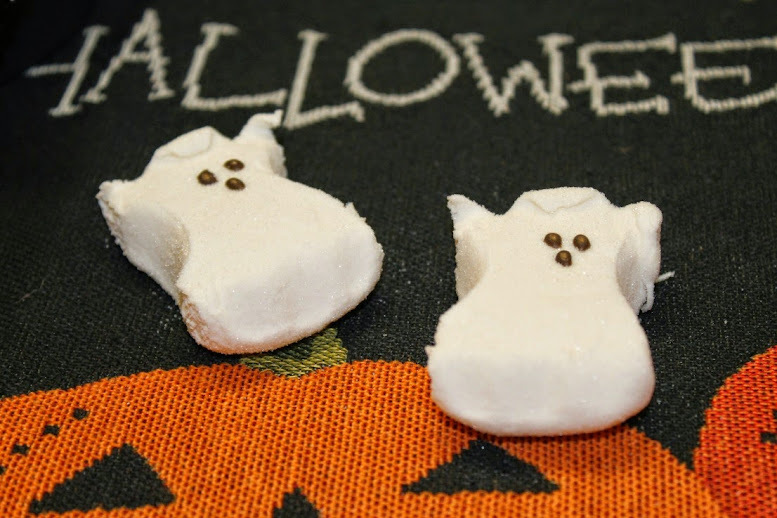 There are a lot of fun and funky candies available this time of year, like ghost-shaped PEEPS, wax fangs, etc. Sprinkle a few over a Halloween-themed tablecloth or runner for the easiest decorations of all. Double the bang for your buck by purchasing items with dual purposes, like a grapevine pumpkin that can be used all the way through Thanksgiving. Or this cute ghost wax warmer from Halloween Forevermore; you get a decoration and a way to add a delicious scent to your home. They have other designs to choose from, too, like a monster or double jack o’ lanterns. Another quick and easy idea – grab one of your brooms and set it outside your door. If you happen to have some black ribbon, tie some around the top of the handle and let them stream down for a super-easy Witch’s Broom. What are your easy Halloween decoration ideas?